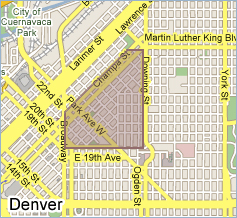 The Five Points neighborhood is located east of Curtis Park and Ball Park and is just east of the city center in an area identified as Denver South East. Keeping this in mind, Five Points Denver homes for sale vary greatly from area to area and is bordered on the west by 20th Street, the south by 20th Avenue, the east by Downing and the north by 38th Street and the Platt River. However, the boundaries of Ballpark and Curtis Park overlap much of Five Points, making it more of a conglomerate of these neighborhoods than a distinct place. From the hip industrial lofts of Ballpark to the old Victorians, flat-roofed row houses and urban condos of Curtis Park, Five Points occupies a large and eclectic section of the city. Bordering on downtown, LoDo and Uptown, there’s everything from high-rise apartments to concentrated Victorian (including Queen Ann’s), stylized industrial lofts and urban-chic condos. Similarly, the aesthetic of the neighborhoods vary from parking lots and cityscapes to tree-lined streets and small front yards. The amenities of Five Points are as varied as the architecture. From baseball games under the floodlights of Coors Field to an afternoon in the pool at Mestizo-Curtis Park, almost anything is available. With at least two breweries, three parks, three well-know music venues, a library and authentic Mexican food—as well as a direct link downtown via the light rail—Five Points is as well-situated as it is eclectic. Stop in for a drink at Herb’s Hideaway, enjoy the open-air Larimer Street Market or walk down a stretch of history on Welton Street. Finally, 20th Street and Broadway are both major thoroughfares with 20th leading to I-25 and Broadway/Brighton Boulevard leading to I-70. With Ballpark and Curtis Park overlapping much of Five Points, the development in those areas is included in those neighborhood descriptions. Because of this overlap there are few projects slated for the small area that remains. These include a 15 unit apartment building called the Lawrence Place Apartments and a 139 unit building with 11 townhomes and 128 apartments going up between Tremont and Court. Search Five Points Denver homes for sale online or contact us today.